Congratulations! 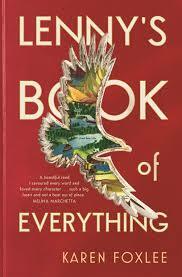 You have each won a copy of the heart-warming new novel by Karen Foxlee, Lenny's Book of Everything. Thank you to ALL who entered and allowed us into their worlds. Be sure to visit again for more exciting giveaway opportunities plus the chance to read our KBR review of this fantastic book in December. Thank you, Dimity and Kids Book Review! I am so excited about winning a copy of Karen Foxlee's "Lenny's Big Book of Everything". I can't wait to read it! You are so welcome, Norah. Hope you enjoy this fantastic book as much as we did.